Review posted September 28, 2016. Simon & Schuster Books for Young Readers, 2016. 40 pages. 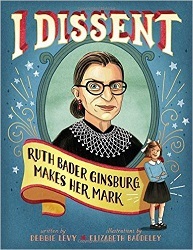 Here’s a picture book biography of Supreme Court Justice Ruth Bader Ginsburg. The story is simplified for young readers (I’d say middle to upper elementary), but strikingly told. You could say that Ruth Bader Ginsburg’s life has been . . . Disagreement with creaky old ideas. This is how Ruth Bader Ginsburg changed her life – and ours. Although the story is told quite simply, it’s still filled with details. We learn about her childhood in 1940 in an immigrant neighborhood, her love of reading, and family travels where they saw signs that Jews weren’t allowed. Ruth was left-handed, but was told to use her right hand and got a D in penmanship – until she protested. I like the pages where it tells what she doesn’t do well – cooking and singing. After she got married, her family agreed that it was best for her husband to do the cooking. But the bulk of the book covers her career as a lawyer. They speak in general terms of cases she presented before the Supreme Court, and then her appointment to the Supreme Court. There are notes at the back with more information and listing specific cases. I didn’t know before that Justice Ginsburg wears a different lace collar over her robes when she writes a majority opinion from the one she wears when she writes a dissenting opinion. Justice Ginsburg said when the court wouldn’t help women or African Americans or immigrants who had been treated unfairly at work. when the court rejected a law meant to protect the right of all citizens to vote, no matter their skin color. when the court said no to schools that offered African Americans a better chance to go to college. This is an interesting story and an inspiring story. I hope many girls and boys will read this story and think about making their own mark.